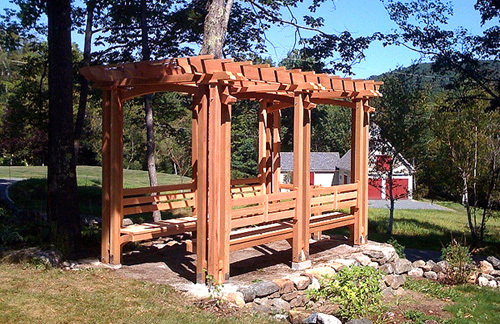 This small pergola kit, on an old stone foundation, establishes an "overlook." The structure was designed in an "Adirondack style" simple, but substantial, with careful attention paid to details, i.e., the pairing of posts, beams and rafters. Softly curved support arches aid in the stability but "flow" with the design.